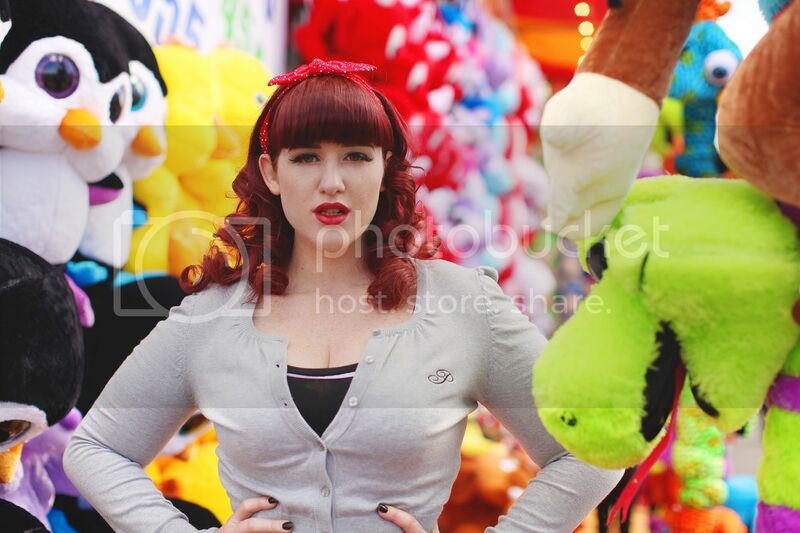 I'm so excited to introduce you to the brilliant Melbourne based label - P is for Pinup! 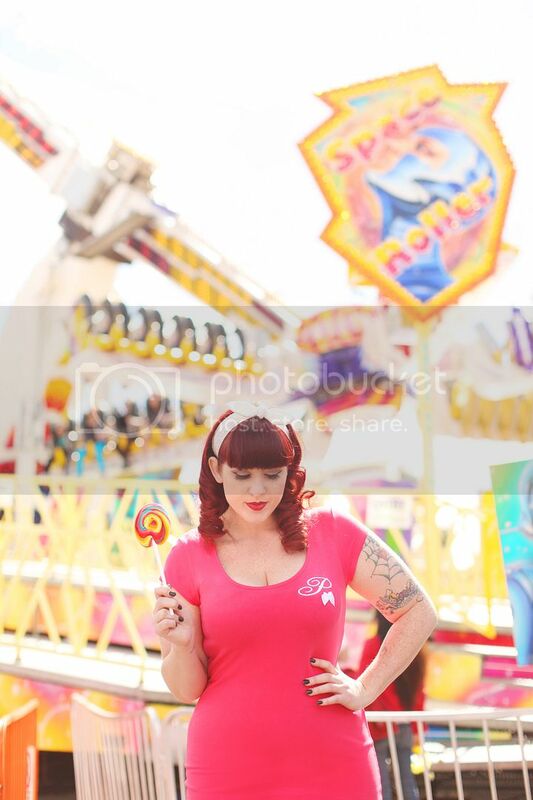 Own and created by the amazing, sweet and stunning Miss Katie Cupcake P is for Pinup is a clothing and accessories label bringing something new into the pinup world. Producing great quality every day garments that are as cute as a button! Started producing this line in early 2009 and her ideas have been growing and developing ever since! 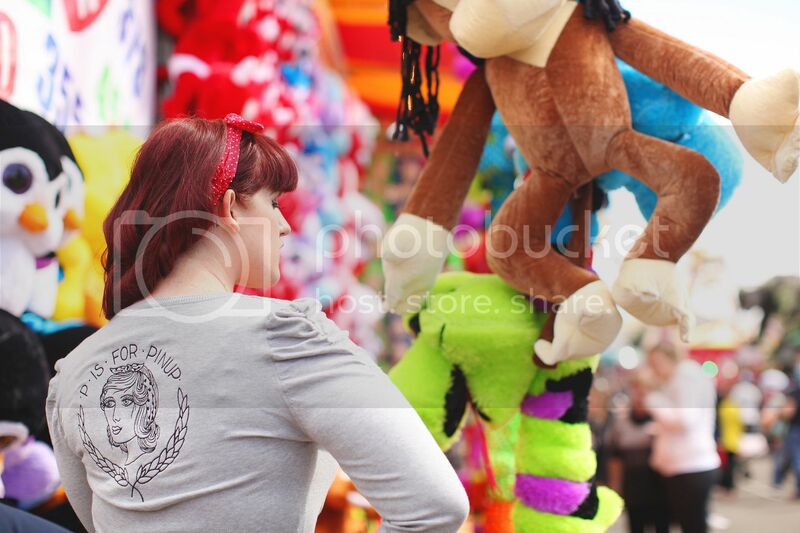 She started off with bags, then bows to match and now P Is For Pinup clothing merchandise. The clothing lines are run in limited edition releases with the logos created by local Melbourne tattooists. The first edition logo was created by the amazing Scotti Allsop of Sanitary Electric and the current line's design is by the one and only Emma Doddrell of Devil's Ink. Katie has chosen clothing items that are comfy for everyday wear, such as hoodies, tees and singlets, but has added a new element of class in the new line with dresses and cardis which you can dress up, for a night on the town, or down, for a day of shopping with the girls. 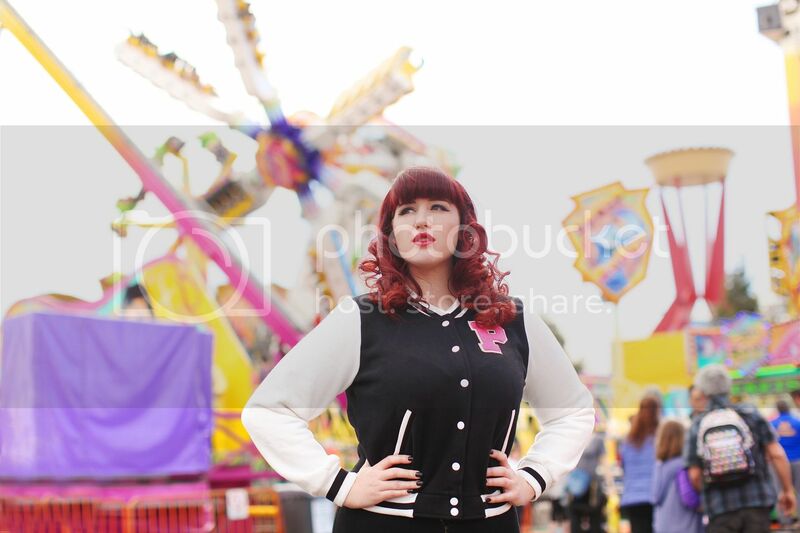 At the end of the day P Is For Pinup is a range of retro inspired handbags and clothing with modern day tattoo twist, created by pinups for pinups. I wanted to showcase these garments in the best possible way and have a location as cute, bright and fun as they look to shoot in. 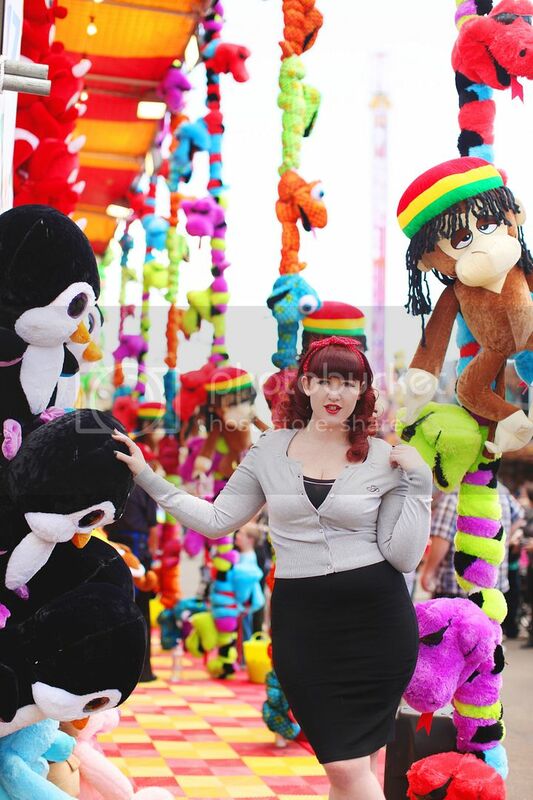 My brilliant photographer Katherine Davis had the fantastic idea of shooting at the Royal Melbourne Show and as you can see it was a perfect fit! 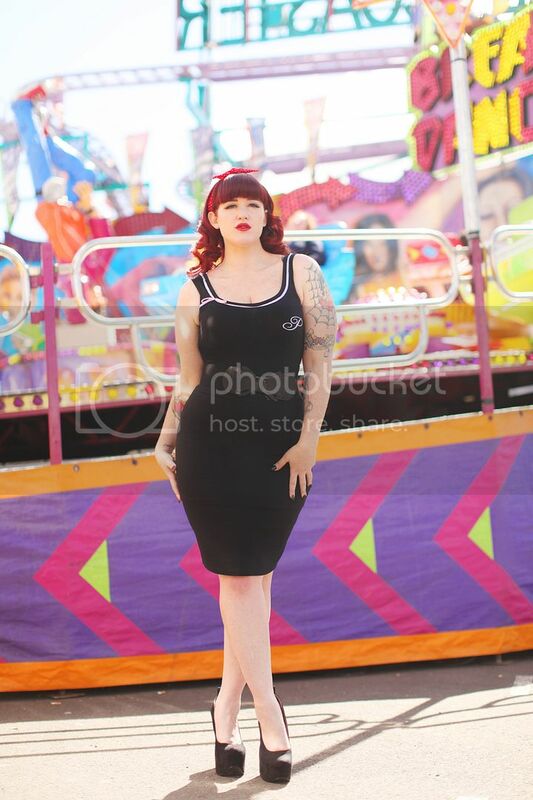 To order any of the garments featured in this post go to the links provided and contact Katie to order via the please personal message on the facebook page or email pforpinup@hotmail.com. 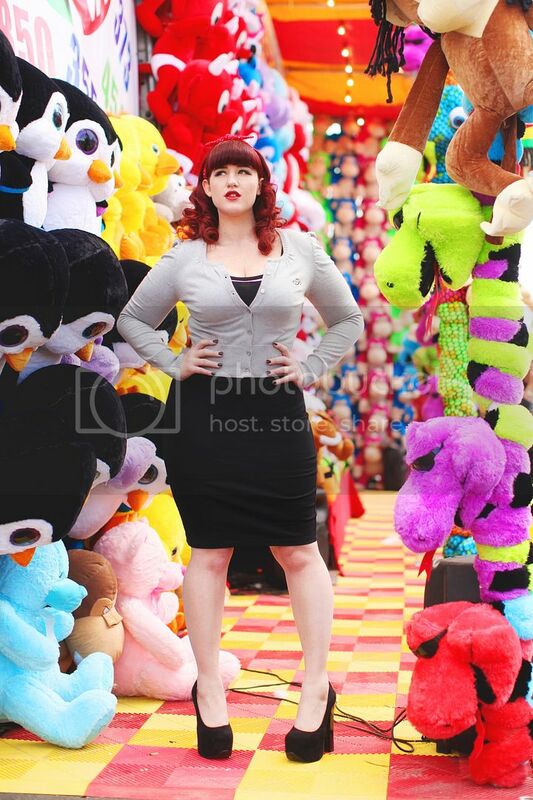 The perfect cardigan to have in any pinup wardrobe. A perfect shape buttoned up or unbuttoned and matches everything I own. I love grey as a staple also. Perfect for autumn, winter and spring and when you need that little bit extra or wish to layer. I'm wearing this style cardigan in a size 12 and it is a perfect fit due to the stretchy fabric. Currently the other colour - red is sold out but I would kill for multiple colour options! The fit is so unbelievably comfortable and totally pinup perfect at the same time. The embroidery on the front and back is perfect! The long sleeves also make this cardigan brilliant for the cooler weather we are having in Melbourne this week I usually layer this under my faux leather moto jacket for a perfect look. As soon as I slipped into this Letterman jacket I knew we were a match made in heaven. 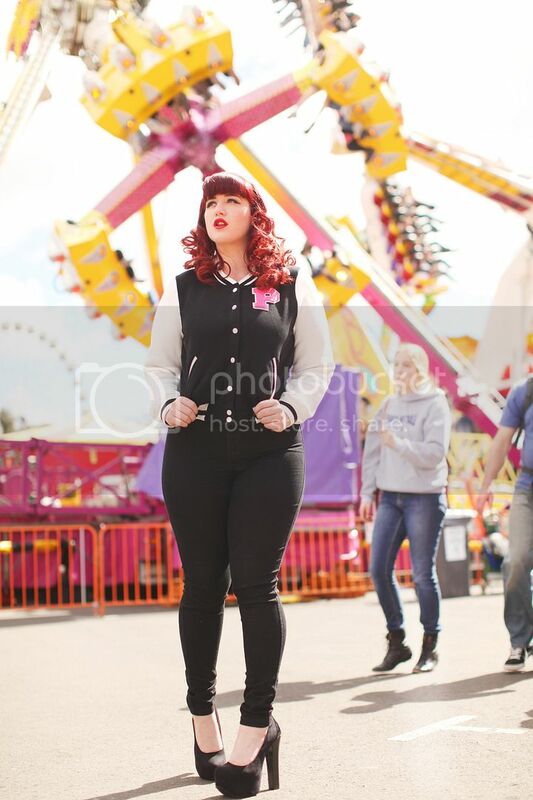 I was not if sure my body shape would suit this style but no I know it was fate for us to be paired together! Made from a super soft fabric this jacket is like wearing a babies blanket! The cropped shape nips in at my waist so I can emphasize my curves and still rock the letterman shape without feeling boxy. I'm wearing this style in the Large and it fits like a dream. The large P patch on the breast just adds that pop of colour and cuteness needed for a feminine version of a usually very masculine jacket. 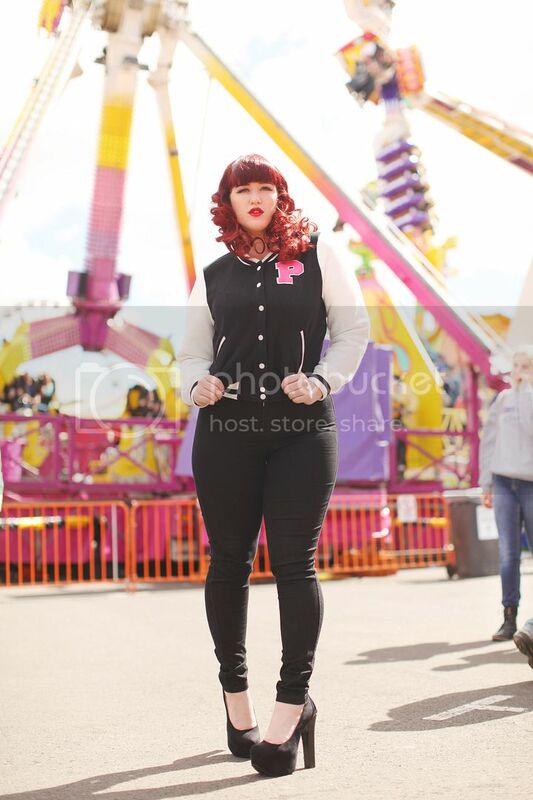 Paired with my American Apparel high waisted easy jeans this is my perfect outfit! They compliment each other perfectly. I now want, no NEED all the Letterman jackets in navy and in pink. This style will be my biggest addiction to date! How adorable is the embroidered back? A perfect black stretch cotton mini dress which I'm wearing as a tank top. I know some of my readers are not big fans of super short mini's so I wanted to show you that you can wear them as more than just a dress! This like the other tops has embroidered details and the extra adorable ribbon feature of around the neckline -so sweet!! Available in black, white and pink. 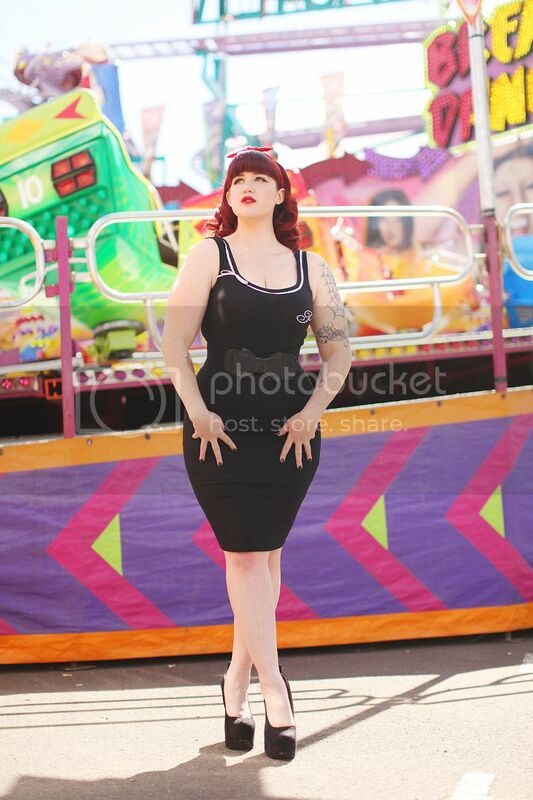 I'm wearing this style in a Large and it is stretchy, fits my rather large bust and looks adorable. I've paired this with my Wheels and Dollbaby Essential Logo skirt and one of my many waist belts. Wearing the skirt over the top adds a little more length than this style would have usually as a dress. This is such a perfect yet so easy to put together and wear outfit. Wear it day or night just change your accessories and shoes. 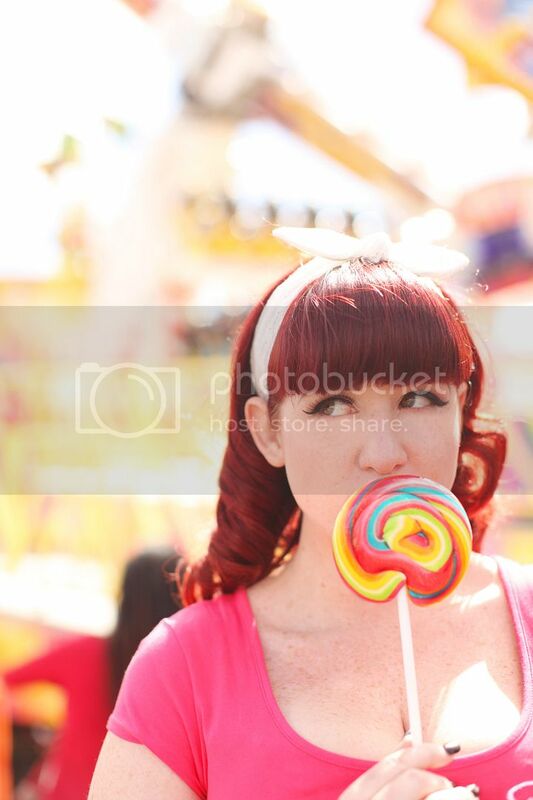 This coral mini dress is as sweet as sugar so I had to pair it with the most appropriate accessory - a giant lollipop. Made of super stretchy cotton like the previous dress this is worn in a size XL for a little more room and length. The coral is a stunning colour and I'm actually loving it paired with my red hair. I also wear this style as I did with the black singlet dress as a top underneath high waist skirts as the length works perfectly with all my pencil skirts. Paired with black the colour pops even more! 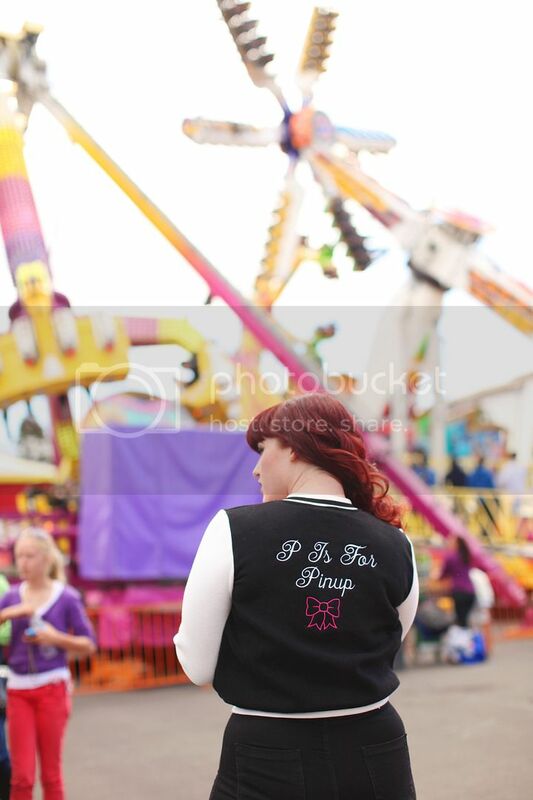 All P is for Pinup's items are available in sizes 8-16. Check out the product link to see the full product shots and the embroidered backs of all garments as many have different colour options and great little details. I currently have a few raglans, more letterman jackets and singlets on my wishlist - what's on yours? 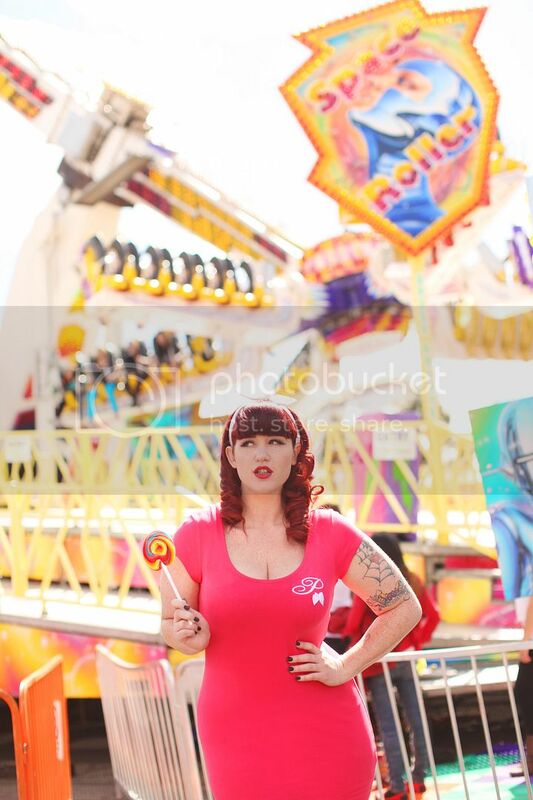 You can view the whole range and contact P is for Pinup via the Facebook page found here. The whole catalogue is also featured on the Facebook page just click this link and order up big! Many thanks to the brilliant Katherine Davis for her outstanding work, she knocks my socks off each and every time I work with her! Thanks for this post! I was looking for aomething like this shopfor a bit long time! So many cute and casual items I'm wishlisting everything!